My day planner, that is. 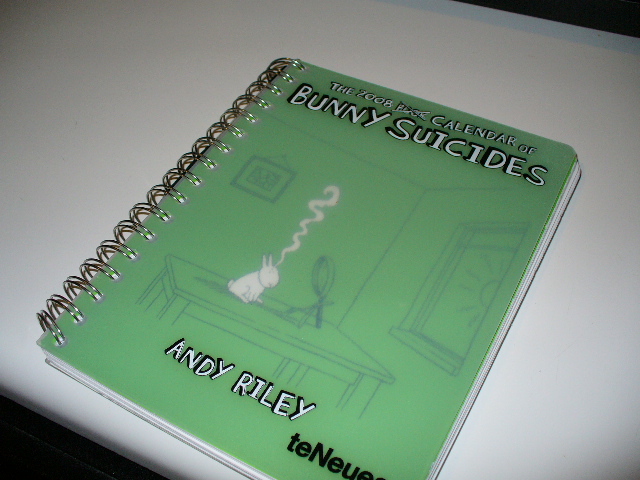 I got this sturdy teNeues personal planner called “The 2008 Calendar of Bunny Suicides”. It has a nice firm front and back cover so you don’t have to hunt down another book to balance it on when you write stuff in it, and it has nice thick pages, so if you were inclined to write in an array of different color fine-pointed Sharpies (green for birthdays, red for action items…) the color doesn’t bleed through to the next page or even the back of the page. If you have never used I, I highly recommend it. It doesn’t have the savory odor of traditional liquid white out, but it is a far superior product. This entry was posted in Uncategorized and tagged The Day Planner. Bookmark the permalink.